Shakshuka (Şakşuka in Turkish) is a very popular and traditional mezze, appetizer or side dish, with a song to its name. “Shakshuka, shakshuka.... shakadashuka”.. It is an easy to make dish and very common in many restaurants in Turkey. The recipe below is from my cousin Sultan who loves to entertain and cook. Cut all vegetables in 2 inch cubes after washing. Fry them in olive oil that is preheated but not burnt. In a separate pan, add the minced garlic in preheated olive oil, and fry it bringing out the wonderful aroma. Add thinly diced or grated tomatoes to sauteed garlic. Cook the tomatoes just a bit in the oil and then add lemon juice from one lemon and half a small glass of water. Let it continue cooking in medium heat for another 10 minutes. Spread this sauce on a layer of separately cooked vegetables and serve this dish warm or cold, as you prefer. If you choose to serve it hot, you can also add a pinch of hot pepper to give it a kick. Enjoy this dish as a mezze -appetizer-, or a vegetarian lunch. 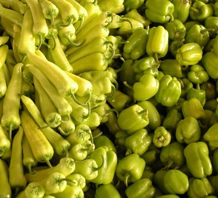 Turkish green peppers are quite smaller and have thinner skin than those we find in the US. For this recipe, use longer peppers.